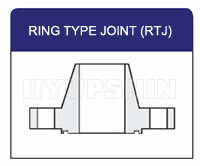 Flange Facing: The finish of contact faces of pipe flanges and connecting end flanges of fittings shall be judges by visual comparison with Rastandards (See ANSI, ASME B46.1) and not by instruments having stylus tracers and electronic amplification, the finishes required are given below. Other finishes maybe furnished by agreement between user and manufacturer. Raised Face and Lare Male and Female: Either a serrated concentric or serrated spiral finish having from 24 grooves/in. to 40 grooves/in. shall be used. The cutting tool employed shall have a 125 μin. roughness. The most widely used of any gasket finish, because, practically, is suitable for all ordinary service conditions. This is contonuous spiral froove. Flanges sizes 12" and smaller, are produced with a 1/16" round-nosed tool at a feed of 1/32" per revolution. For sizes 14" and larger, the finish is made with 1/8" round-nosed tool at a feed of 3/64" per revolution. This finish is produced by using a 90° included-angle [V] tool, making a spiral groove 1/64" deep of 1/32". This finish a produced by using a 90° included-angle [V] tool, making concentric groove 1/64" deep and 1/32 apart. This finish is produced by several shapes of tools cutting at speeds and feeds which leave no definite tool marks apparent to the naked eye. Either a serrated-concentric or serrated-spiral finish having from 30 to 55 grooves per inch is used. The cutting tool empolyed has an approximate 0.06 in. or larger radius. The resultant surface finish has a 500 microinch (12.5 ㎛) approximate roughness. 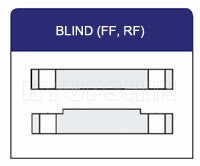 The gasket contact surface does not exceed 125 microinch (3.2 ㎛) roughness. The inside wall surface of gasket groove does not exceed 63 microinch (1.6 ㎛) roughness. Bland flanges need not be faced in the center if, when this center part is raised, its diameter is at least 1 in. smaller than the inside diameter of fittings of the corresponding pressure class. When the center part is depressed, its diameter is not greater than the the inside diameter of the corresponding pressure class fitting, Maching of the depressed center is not required. The standards of pipe flanges and fittings with ANSI, DIN, UNI, BS, JIS, KS, GOST, SABS etc. 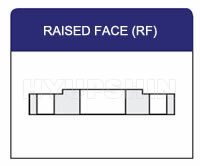 The raised face is the most common used flange face. It is called raised face because the gasket is raised 1/16″ and 1/4″ above the bolt circle face: 1/16″ for 300 lb. and less, 1/4″ for 400 lb. and more. The flange facings are machine finished toANSI/ASME B16.5 requirements. Either a serrated-concentric or serrated-spiral finish having from 30 to 55 grooves per inch is used. The cutting tool empolyed has an approximate 0.06 in. or larger radius. The resultant surface finish has a 500 microinch (12.5 ㎛) approximate roughness. Typically these flanges are used on pump facings or on fiberglass flanges where the torque of compressing the gasket will damage the flange body. They are found in 150# and 300# ratings. Their principal use is to make connections with 125# and 250# cast iron flanges, respectively. Class 300 and larger) – This flange is normally used for high pressure gas pipe work. Ring type gaskets must be used on this type of flange. Blind flanges need not be faced in the center if, when this center part is raised, its diameter is at least 1 in. smaller than the inside diameter of fittings of the corresponding pressure class. When the center part is depressed, its diameter is not greater than the the inside diameter of the corresponding pressure class fitting, Maching of the depressed center is not required.